When you’re planning to spend money on a digital marketing agency, you want to know that your money is going to good use. But, how do you find an agency you can trust? If you’re tired of being burned by agencies that make big promises but deliver no results, check out our agency red flags list below. So, how do you choose the right agency? We’ll walk you through some of these agency red flags that should send you running and give you solutions for finding an agency that is dedicated to your success. Red Flag #1: The agency wants you to sign a contract for a year or more. Good agencies won’t try to lock you into long contracts. They’ll give you control of how long you work with them. Rather than holding you to a contract you can’t get out of if their marketing efforts aren’t working, they’ll instead do their best to deliver great results in order to keep you around. Solution: Find an agency that doesn’t make you sign contracts you can't get out of. Red Flag #2: You don’t have a dedicated account manager, or you’re working with a call center. Great agencies will pair you with a marketing strategist or account manager who oversees your business’s marketing success. And, you definitely shouldn’t have to talk to a new person every time you call. When you’re looking for an agency, make sure to ask who will handle your account. If it’s one person, that’s great. If they’re running a call center, look elsewhere. Solution: When shopping for an agency, ask if you’ll be paired with a dedicated account manager or marketing strategist. If not, move on. Red Flag #3: They only offer inflexible, pre-set plans. Marketing plans shouldn’t be one size fits all. Your marketing agency should talk to you about your goals and build a plan that helps you meet those goals. Even if they have a set of plans they offer to clients, they should still be willing to work within those plans to give you a personalized strategy that works for your business. Solution: If an agency is trying to lock you into a plan that offers no flexibility or customization, find an agency that will actually work with you. Red Flag #4: You don’t have access to your marketing data. If the agency refuses to give you access to analytics, you should find an agency that will let you track your marketing success with them. There’s no reason for a digital marketing provider to be dishonest or hoard a business’s data. Solution: The right digital marketing agency will allow you to see your data, and they’ll talk to you about the analytics as they work to improve your marketing performance. Don’t settle for less than that. You deserve to see where your marketing dollars are being spent and how that spend is affecting your business. Red Flag #5: They promise to get you to the top of Google immediately. If an agency calls, promising to get your business to the top of the search results within a week of sign-up, ask them how. If they’re talking about paid advertising, that’s fine. If, however, they are promising they’ll get you to the top of Google without using advertising, run away. That sounds like black-hat marketing. Solution: Find an agency that is realistic about the time it takes to improve your local search results. Find a partner, not a service provider. 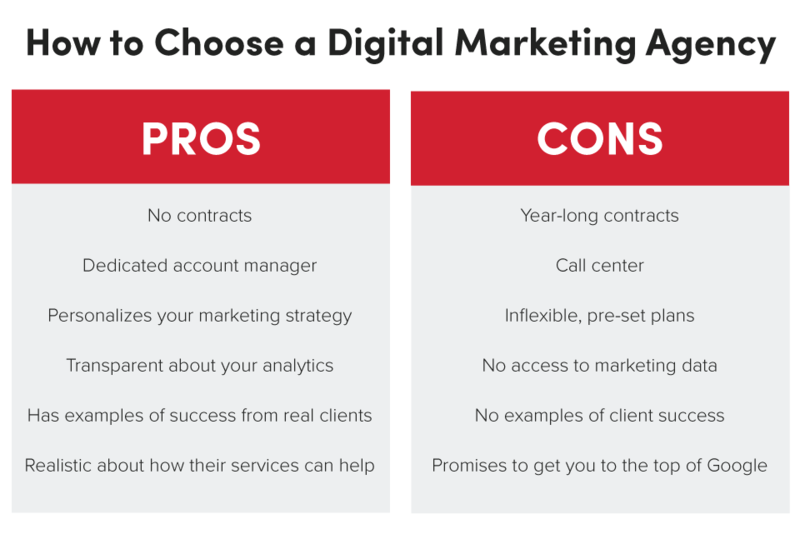 Keep these red flags in mind, and make sure to find a digital marketing agency that partners with you rather than offering a one-size-fits-all solution. This will save you money and time, and you’ll see better growth with an honest, transparent agency that is dedicated to your success.